OK, you know you're supposed to "go over" your test or exam after its over. But HOW do you do that . . . WHY should you do that . . . and WHAT SHOULD YOU BE GETTING OUT OF IT? The reason you should do it is so that you can learn from your mistakes. Not only will you need those concepts you missed when you take the final exam, you'll need them to understand the rest of the course. Besides, you're going to have to identify and fix any problems with your test-taking skills. If you just casually scan your test, then you may not get much out of it. You need to take a more organized, focused approach. Here's a brief video running down how this works. Well with a certain holiday coming up soon, it's probably a good time to share one of my favorite blogs with you . . . a crazy, wonderful blog called SKULL-A-DAY that you should visit. The project started out when this guy named Noah Scalin made a paper skull and posted it, then kept on making skulls in various media and in different forms every day for a year. Then folks just kept adding to it and, well, now it's a pretty big project. The one shown here is one of my favorites . 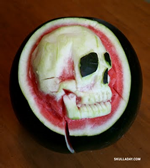 . . a skull carved from a watermelon! There's even a book version now! The book is called SKULLS of course. As many of you A&P students are skull fans by now, or ought to be, I thought you might like to see all those skulls. For Facebook users, there's an application called Send-A-Skull that allows you to send skulls to your friends.